Pushpay is a fintech startup that helps nonprofits (with an emphasis on churches) collect donations. Their blog helps church leaders engage more people in their congregations and communities. They engage their audience at all levels of the funnel: with broad, top-of-funnel content addressing the problems and interests of their audience (whether or not it’s about donations) and narrower content helping people choose a digital giving solution. All this is taking place in an interesting market. 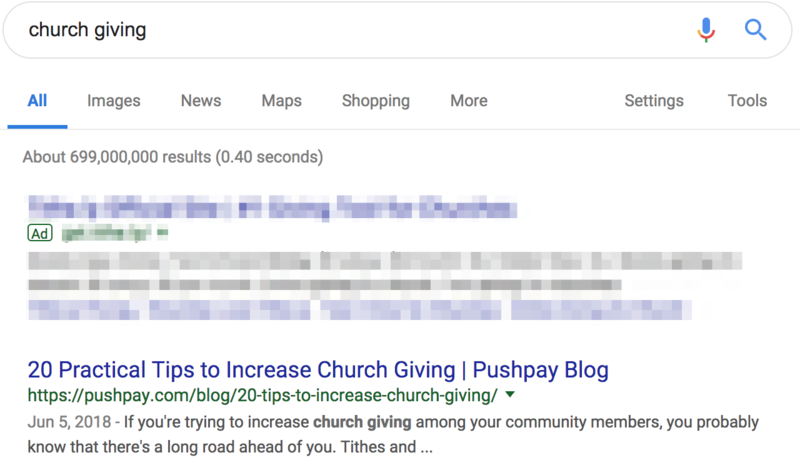 It’s essentially B2B SEO, but the “businesses” Pushpay’s trying to reach (i.e., churches) has a good deal of religious in-speak and very strongly-held beliefs on different issues. When it comes to doing content marketing to church leaders, it’s often a balance of being broad, but not shallow in your approach. The project took about a month to complete—and the new pillar pages were published in the summer of 2018. Pushpay ranks for a good deal of terms—they’re working their way up the SERPs for some of the more competitive queries, but they’ve seen an increase in rankings and organic traffic across top- and middle-of-funnel search terms. Pushpay’s apps make it easier for congregants to give than, say, writing a check. And they have demonstrated success in helping churches increase donations. By ranking #1 for “how to increase church giving,” Pushpay catches church leaders right at the pain point, and provides them with solutions. “Tithing software” is a low-volume keyword, but it’s a way that some people in Pushpay’s audience refer to the product category. Pushpay ranks #1—outranking even software review websites. When Pushpay’s audience sets projections for collecting donations or makes plans to raise more funds, they look for benchmark numbers. And when they do, they find Pushpay. 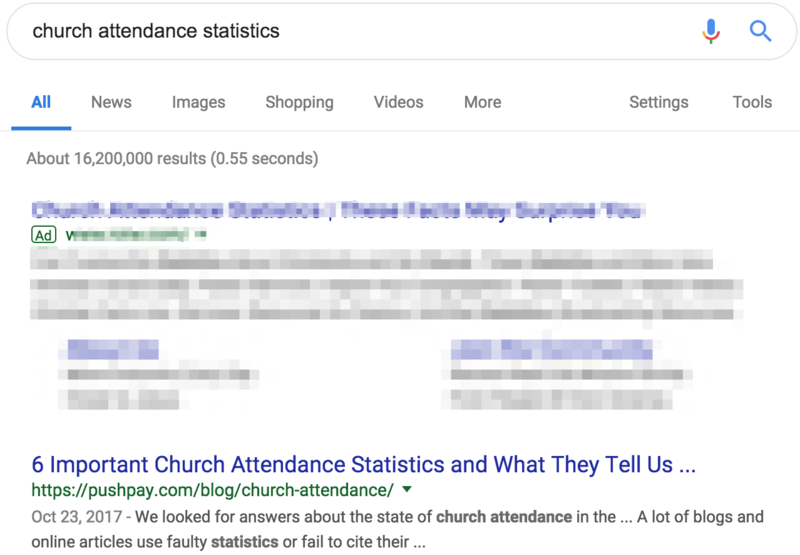 And to top it all off, they rank for general “Church giving” searches, too. The decision-makers in Pushpay’s audience are usually on a mission to grow their congregations. 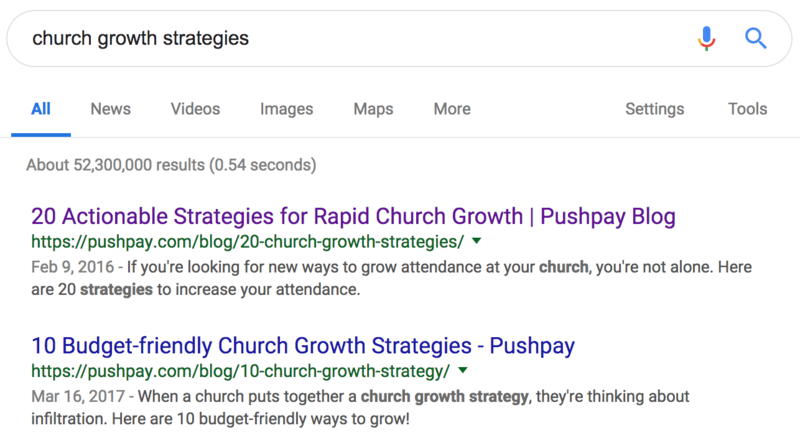 By creating resources that rank when people search for church growth strategies, Pushpay builds an audience to retarget with ads for their lead magnets and case studies. Executive pastors, who tend to make decisions on their church’s major technology investments, are also tasked with making strategies for increasing church attendance. By ranking for “church growth strategies” (both #1 and #2! ), Pushpay gets exposure to the decision-makers they’re trying to reach. A key way that churches grow is by engaging their surrounding communities. Coming up with tactics for doing this can be tricky—and there are roughly 600 searches a month specifically for community outreach ideas. Some of these searches are for non-religious applications, but Google was consistently serving religious results on the first page. Now Pushpay has exposure to church leaders looking to engage their communities, which sets Pushpay up nicely to present their app and donation products. 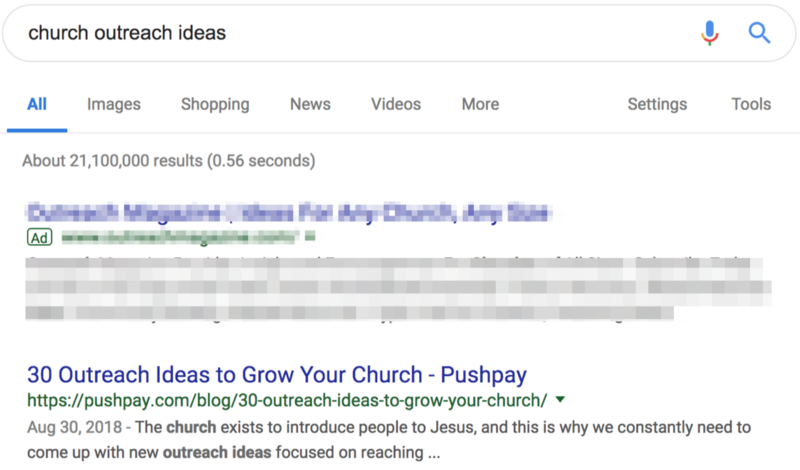 There are even more monthly searches for church-specific outreach ideas—and Pushpay ranks for those, too. 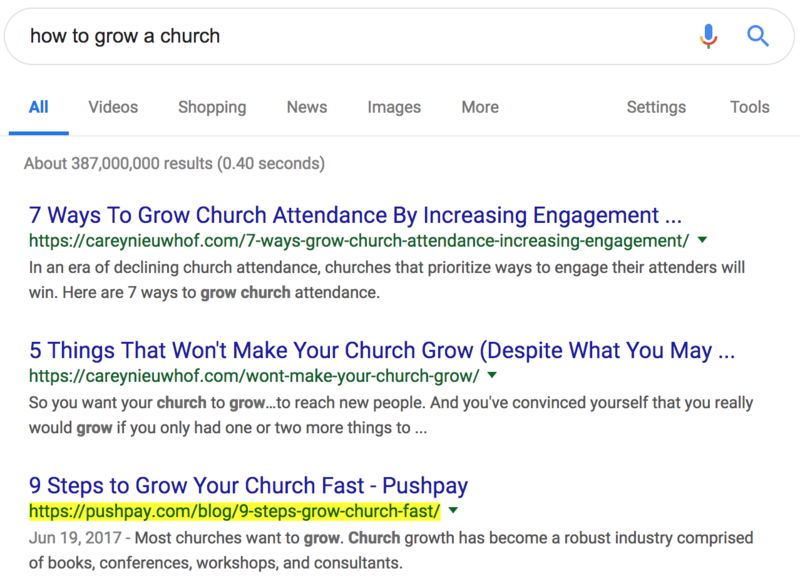 While we had a “best-of” pillar page on church growth strategies, we also wanted a “how-to” post to rank for more tactical searches. Church leaders need benchmarks when they’re making growth and attendance goals. And pastors, journalists, and religious bloggers love having stats to cite in their works. We created a piece that gave these folks what they’re looking for. … and we picked up the more general “church statistics” term along the way. Pushpay continues to rank for several other topics that their market uses search to learn about. Of course, the search traffic doesn’t live in a vacuum—Pushpay uses an elaborate system of retargeting ads, lead magnets, chatbots, email, and other channels to turn organic Web traffic into customers. We’ve helped companies out-educate the competition in multiple verticals—and it often comes down to a combination of cleaning up your blog and creating the pillar pages you need to rank.